For the first time scientists have managed to grow a beating human heart in a laboratory. 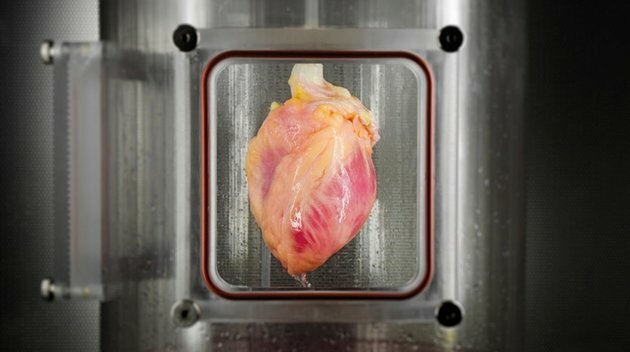 A partially “recellularized” human heart being grown in a bioreactor. A team at Harvard Medical School have regrown an existing donor heart using stem cells to replace cells that might cause rejection in a transplant recipient. In a process not dissimilar to the way mechanics strip down classic cars and restore them, the scientists used a special process to strip away incompatible cells leaving a basic heart “scaffold” and then regrew the heart using the stem cells. Then when the heart had regrown they gave it a jolt of electricity and it started to beat. “While limited in force, these were the first (tiny) beats of a newly formed, human stem cell derived heart,” said Dr. Harald C. Ott, one of the leaders of the experiment. The strange but fantastic medical process is laid out in this paper.